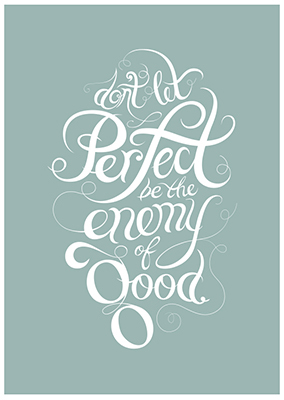 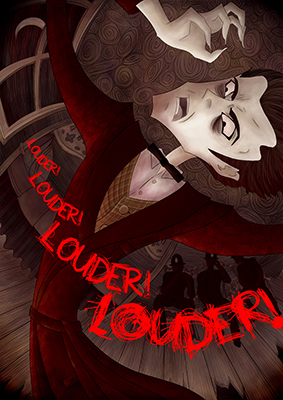 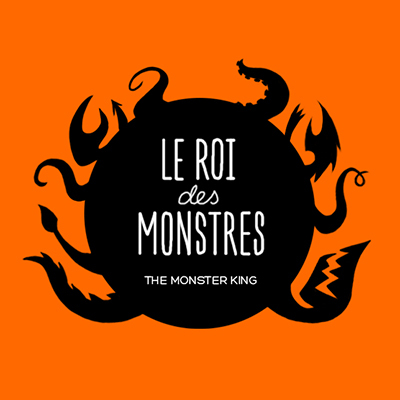 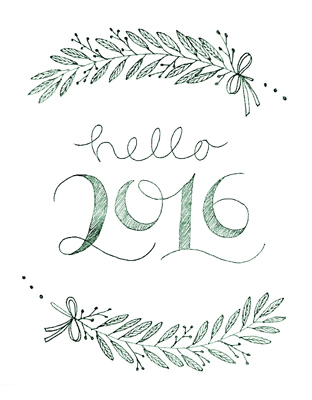 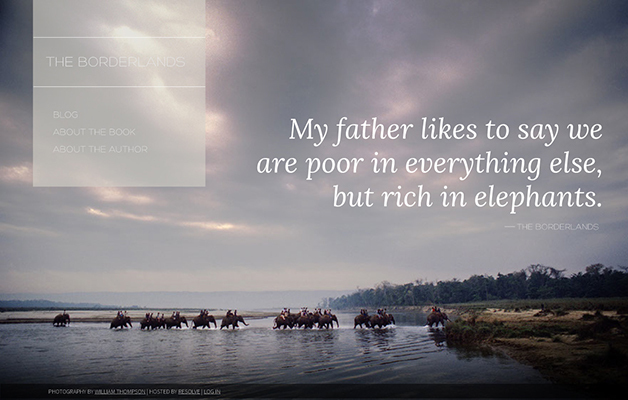 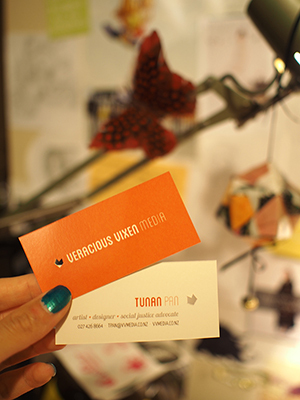 Hi there, I see you've stumbled across my portfolio site - welcome! 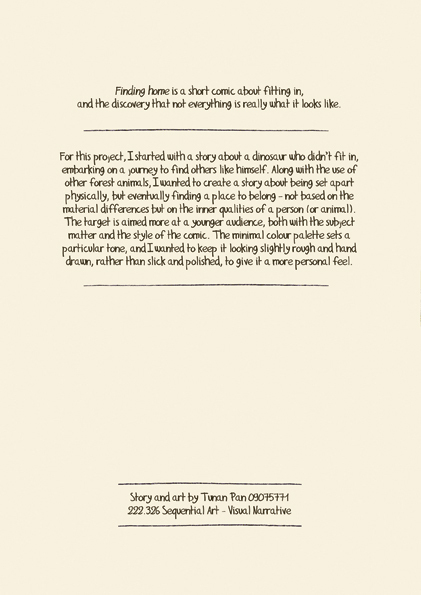 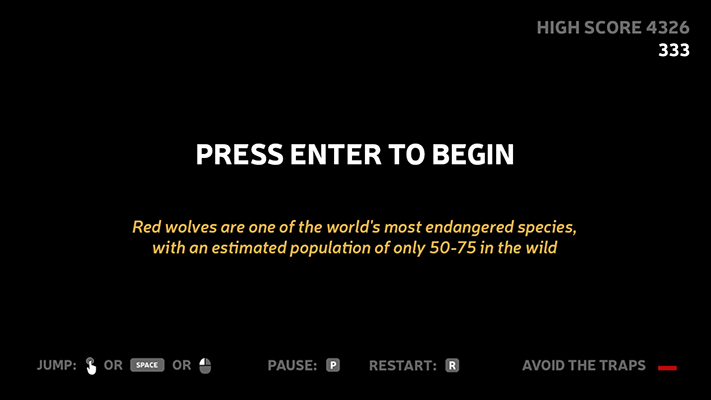 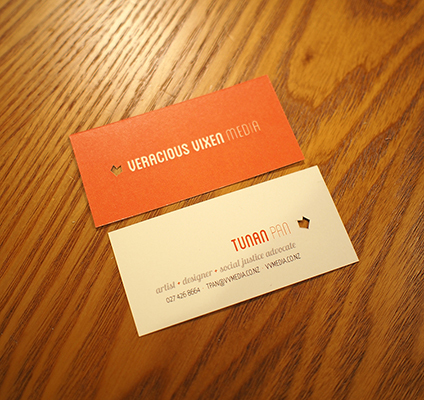 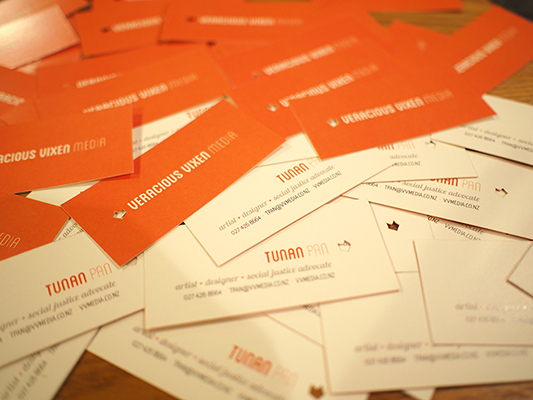 My name is Tunan, and I want to change the world. 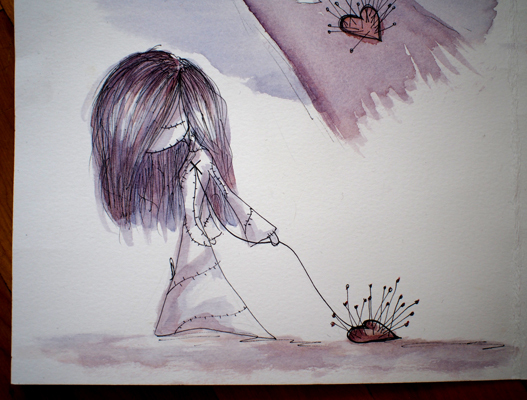 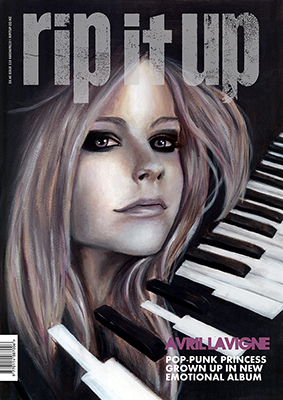 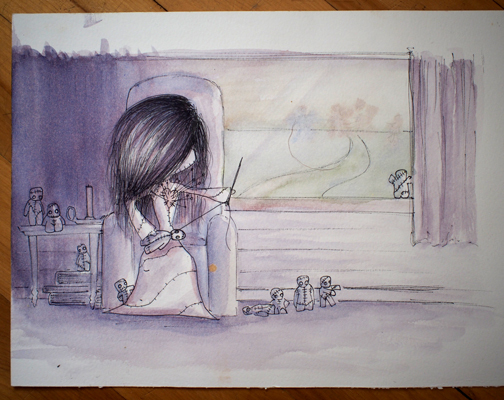 I know, big dreams for a little girl. 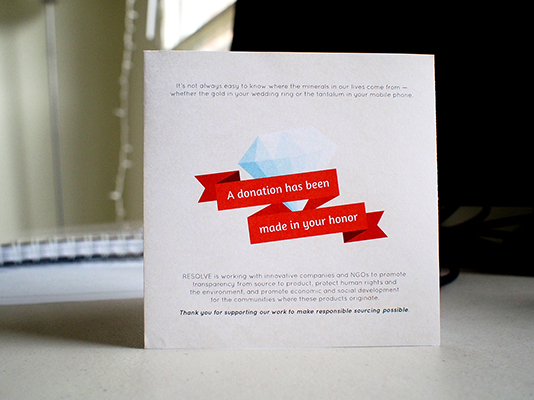 I'm still trying to find my place in the creative industry, but I believe in the power of design and want to use my skills and passions to work on socially impactful projects that help make the world a better place. 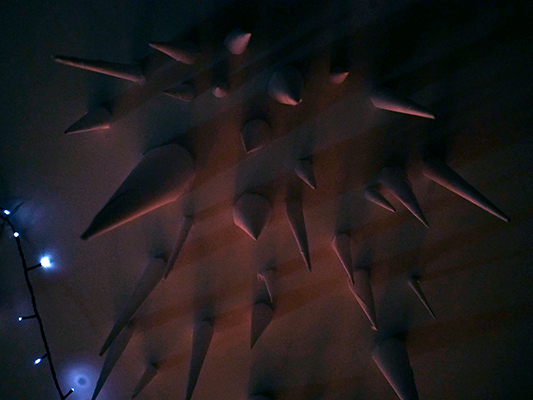 I'm very interested in interactive mediums and spaces, and have recently started to delve into the world of game design + development. 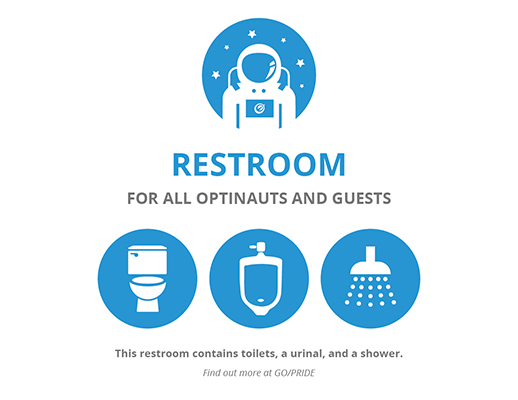 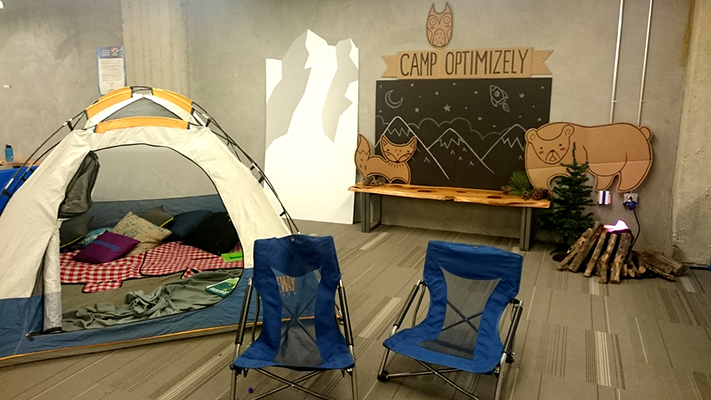 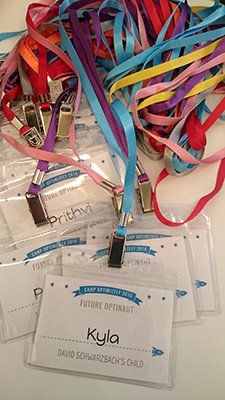 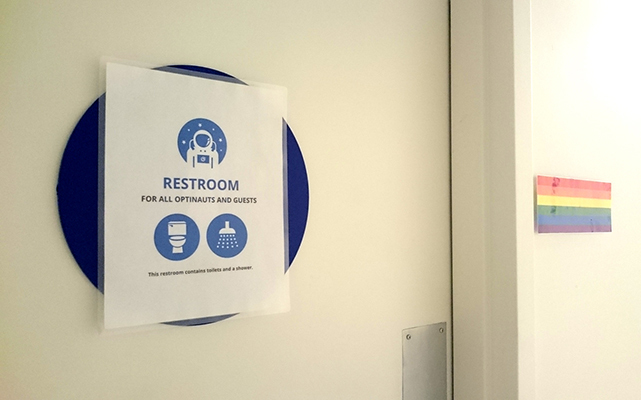 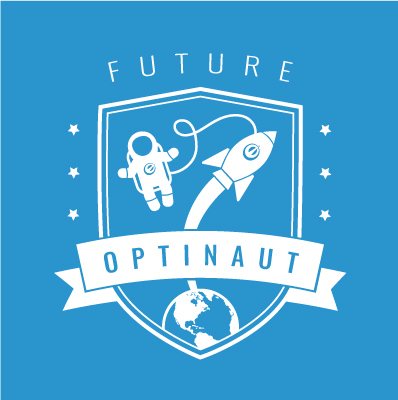 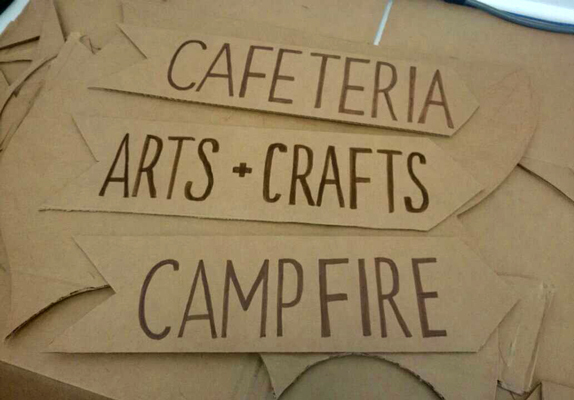 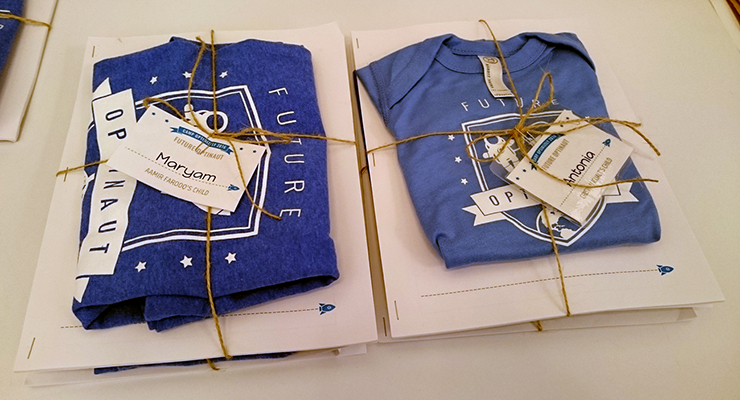 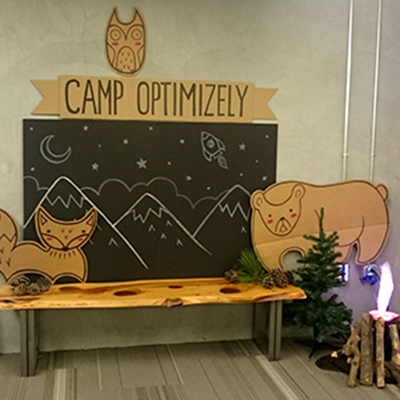 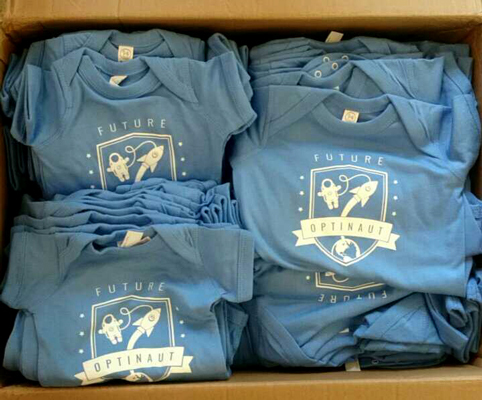 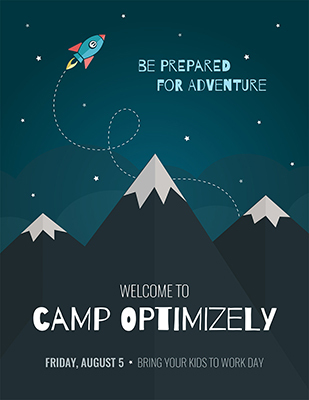 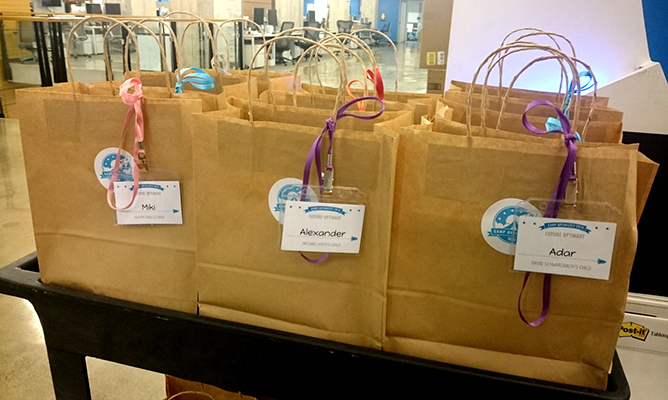 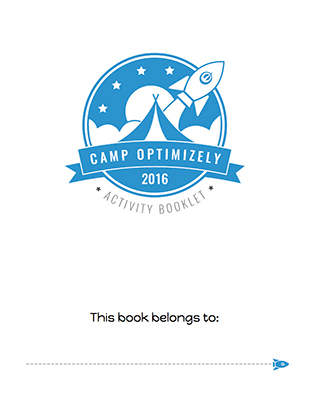 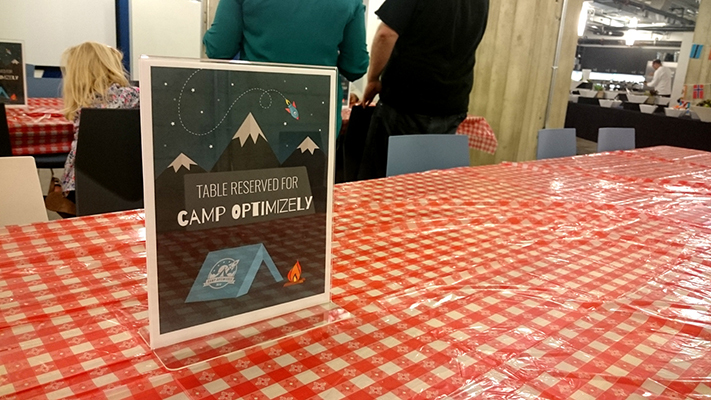 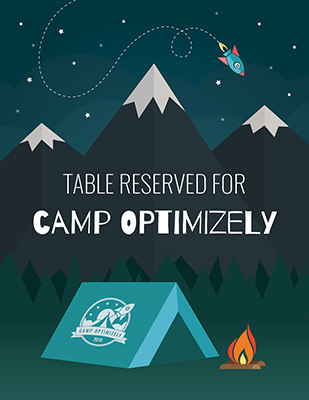 Flyers, goodie bags with activity booklet + merit badges + name tag + tshirt/onesie, photo op wall, and signage, created for Optimizely's camp themed Bring Your Kids to Work Day. 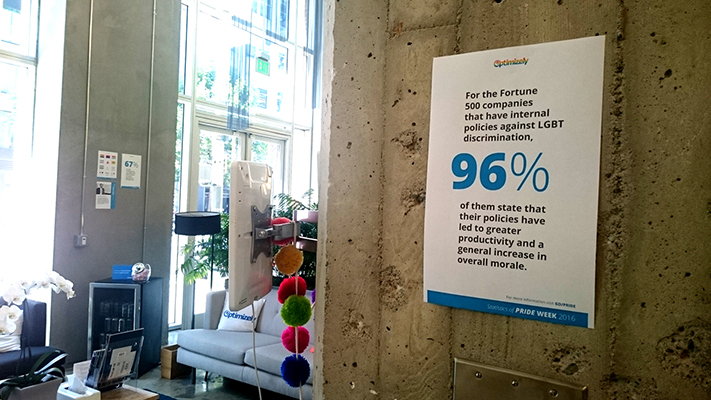 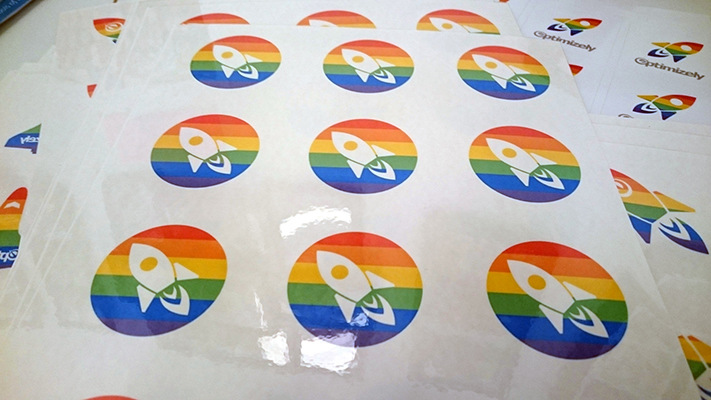 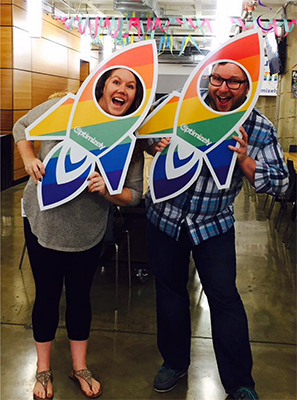 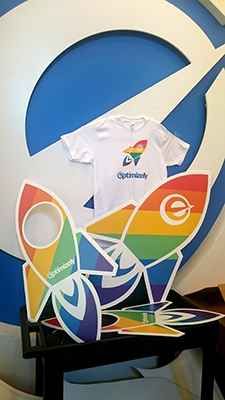 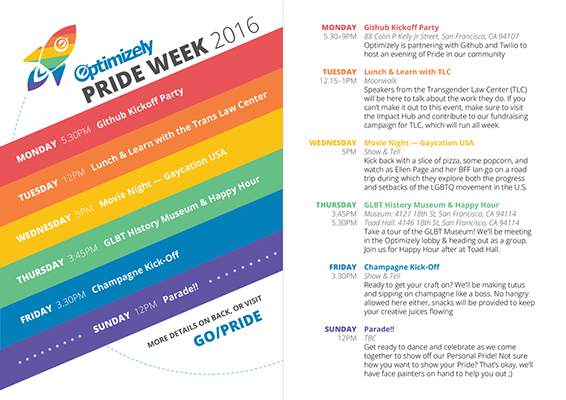 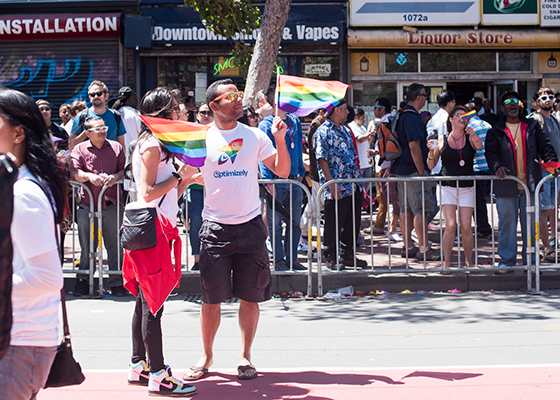 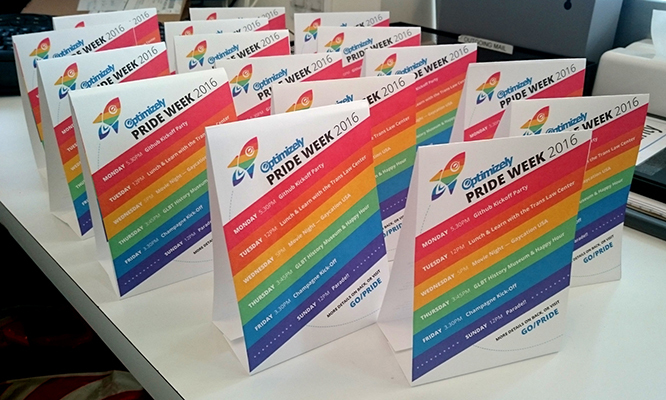 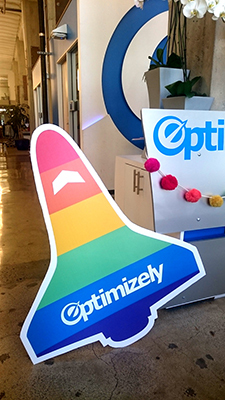 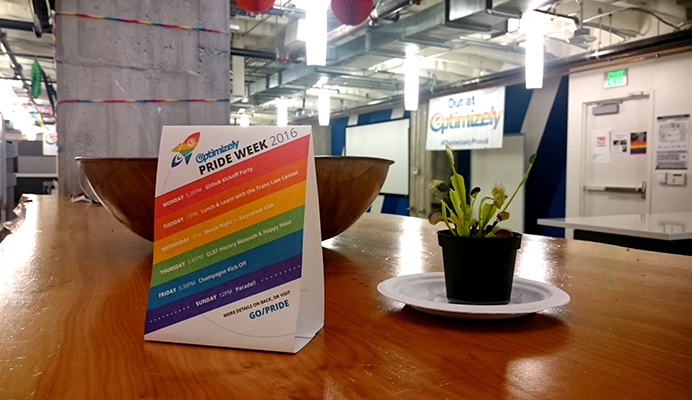 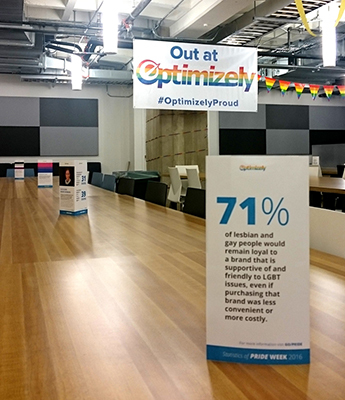 Volunteered my design services to Optimizely's Pride Committee to help out with all the Pride Week office activities, and the parade float. 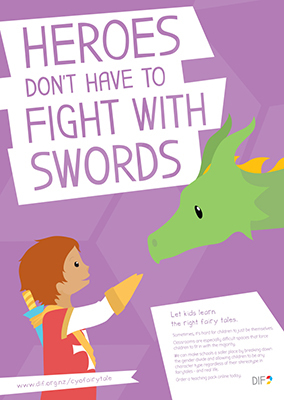 Done over only a couple of weeks, I started off designing t-shirts, temporary tattoos, and an agenda, but then took the iniative to take over the "informational pamphlets" task to put together table-tents and posters with stats and explanations of relevant symbols/flags and people. 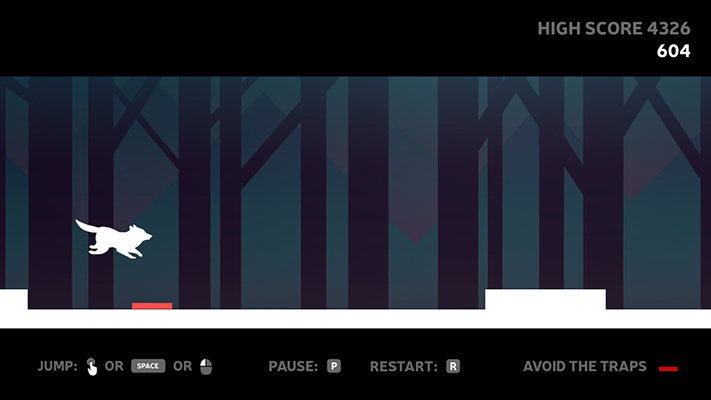 In February 2016 I participated in the Pixelles Game Incubator follow-along program to create my first game over 6 weeks. 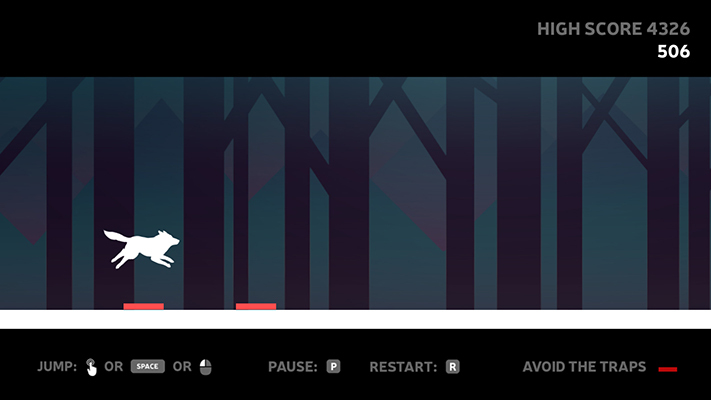 A basic infinite side-scroller jumper game developed from scratch in Unity, coded with C#. 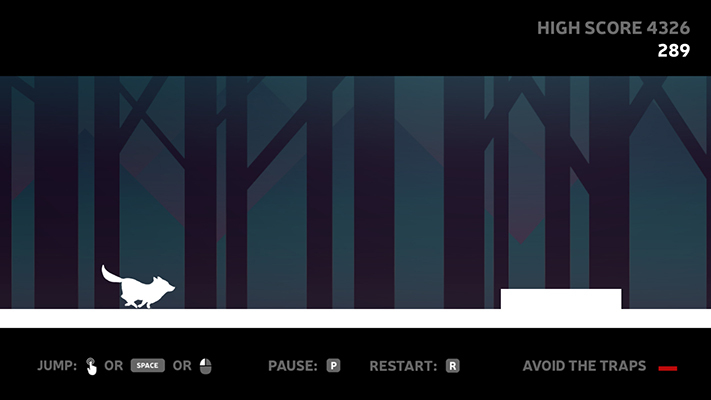 I intend to continue improving this game while I further learn to use Unity, but the curent build can be downloaded and played here. 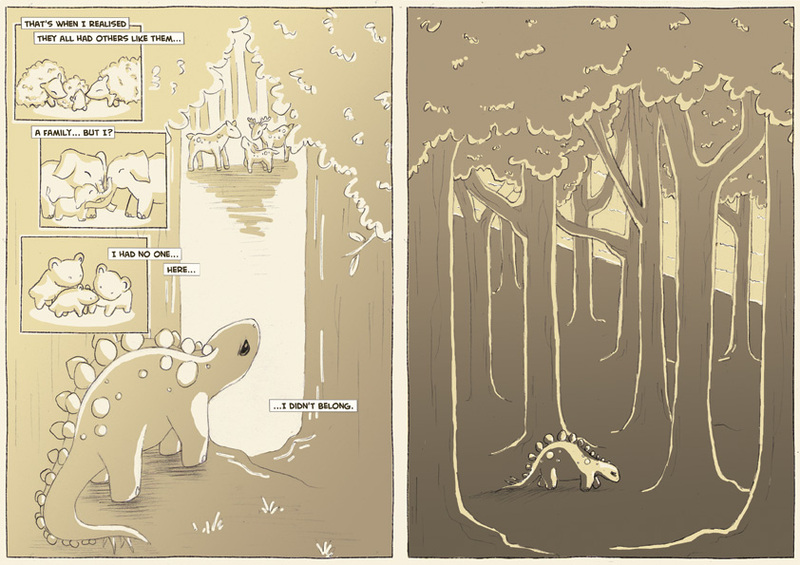 Alien character encounters for my team's game, Stella Wanderer, created at the Toronto Game Jam 2015. 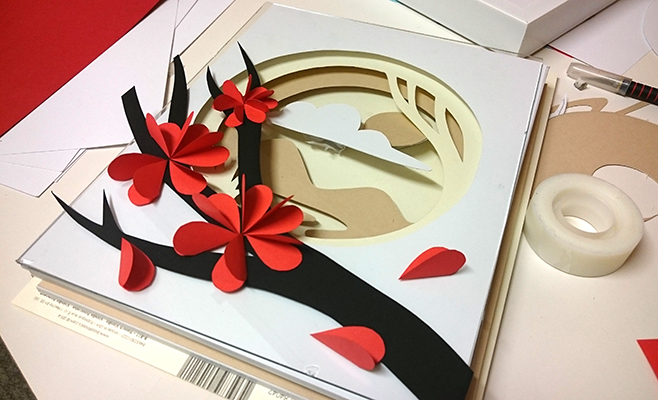 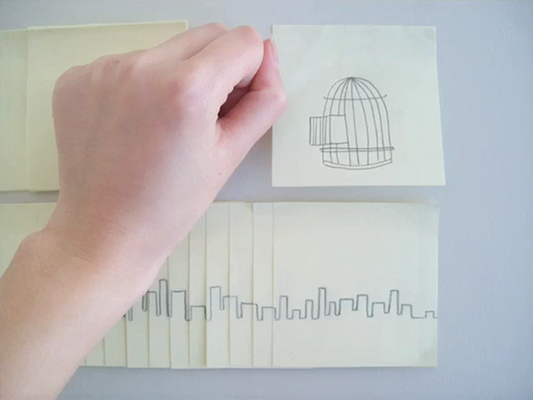 Illustrator, and hand-cut with a scalpel! 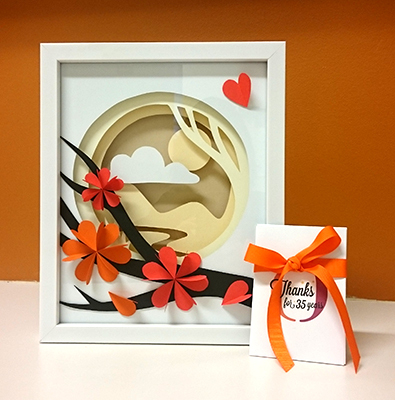 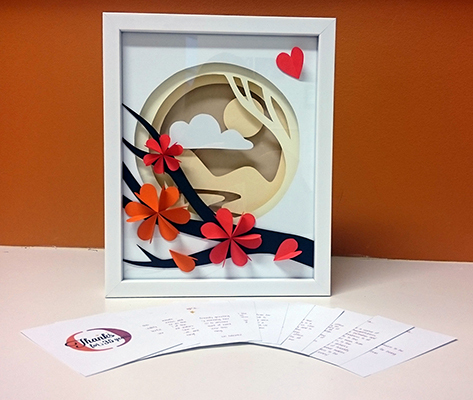 An art frame gift created for one of my workmates, along with small cards with messages from the rest of the team. 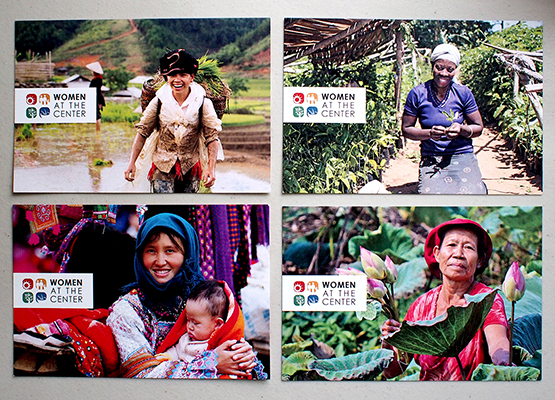 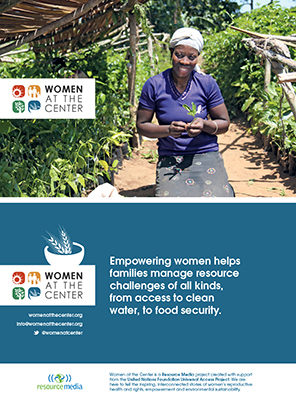 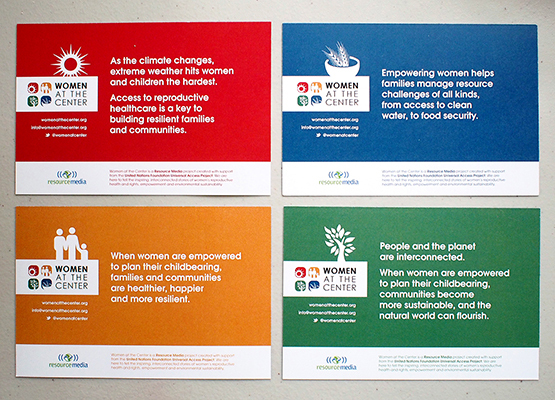 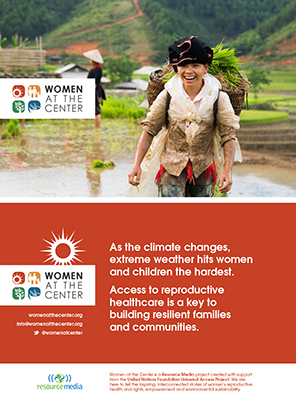 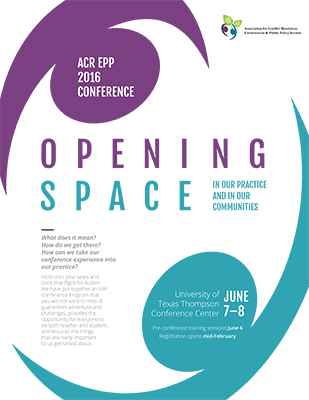 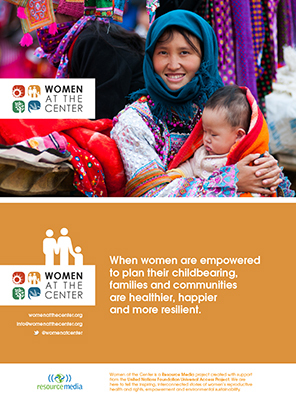 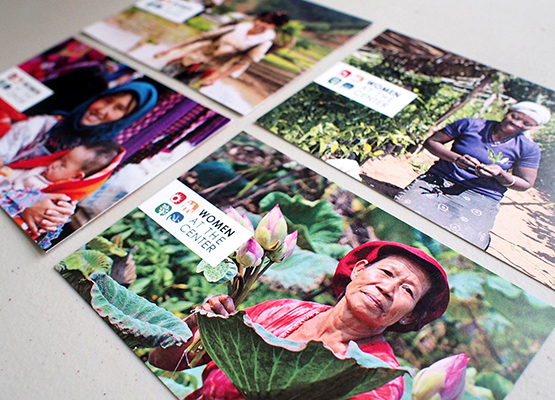 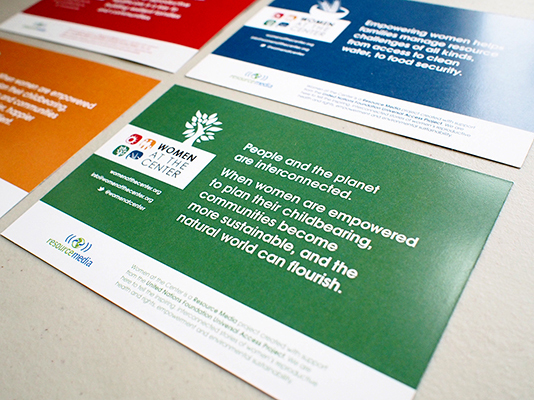 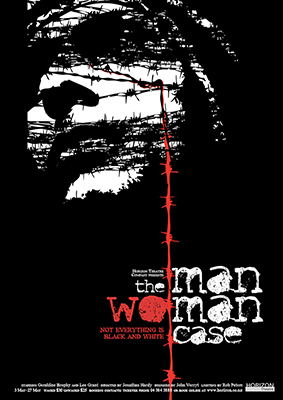 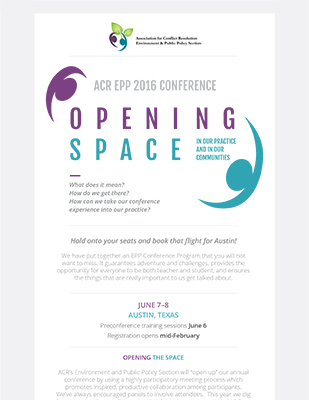 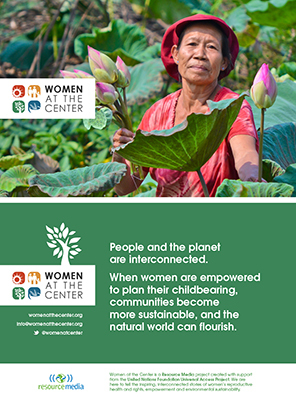 Promotional cards created for Resource Media's Women At The Center, for distribution at conferences. 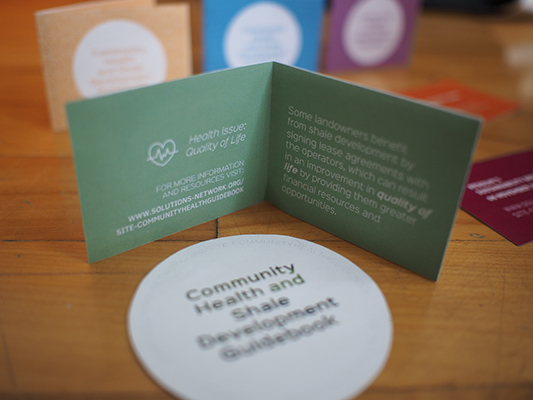 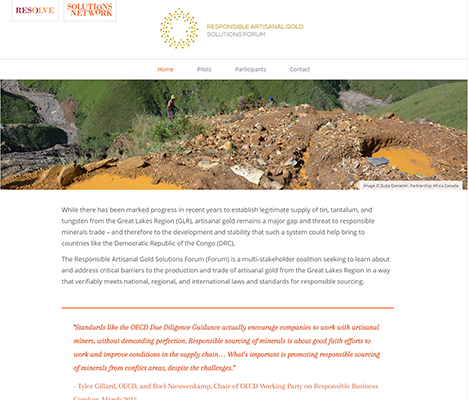 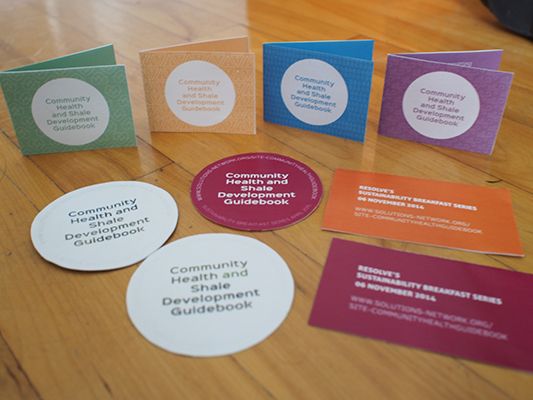 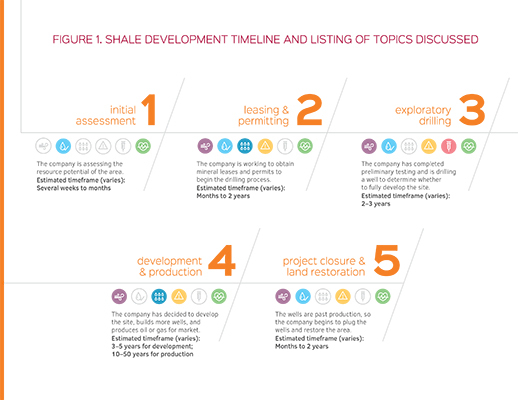 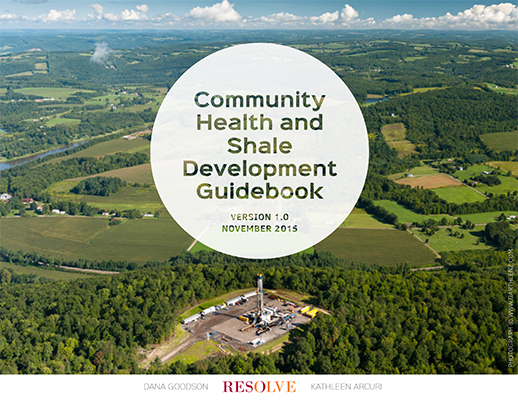 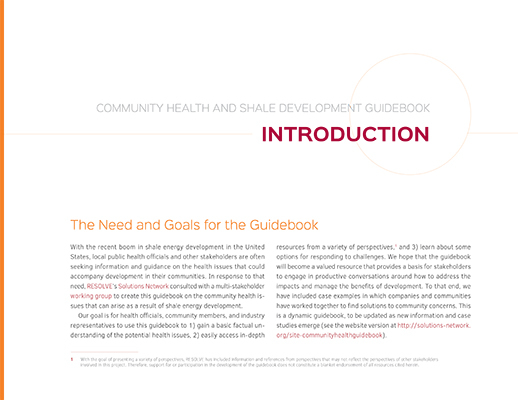 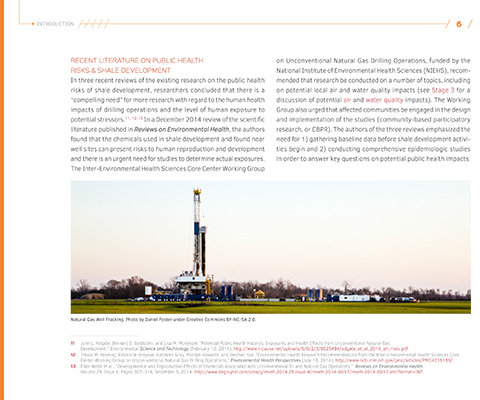 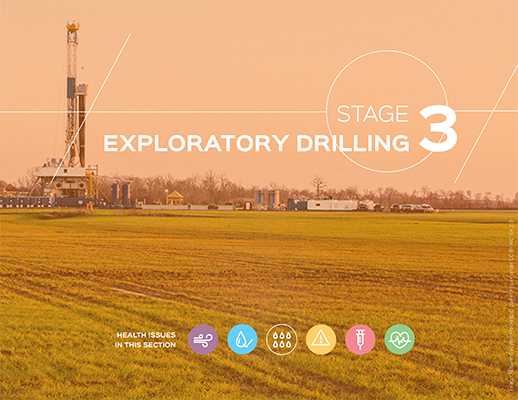 Guidebook, website, and take-away items, for Resolve's project on providing a resource for both developers and communities affected by shale development, to help each side understand each other. 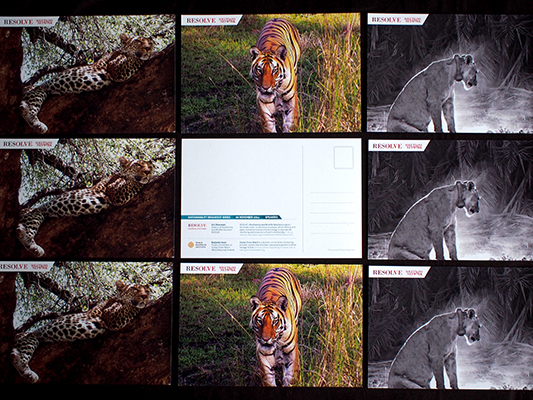 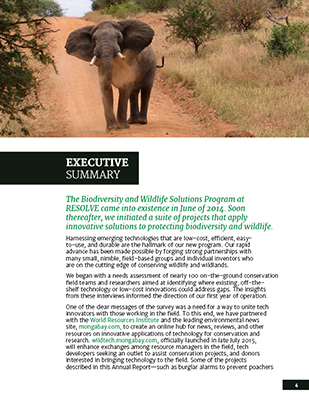 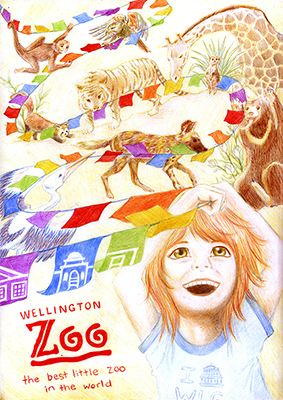 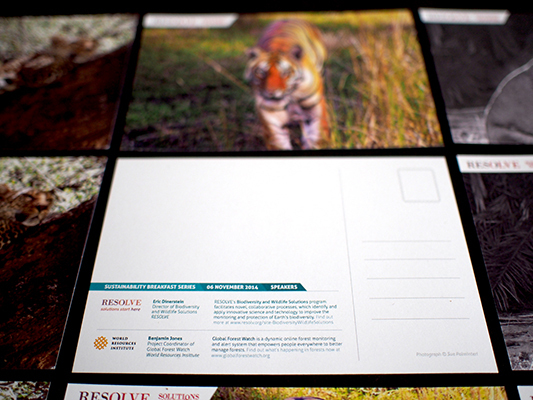 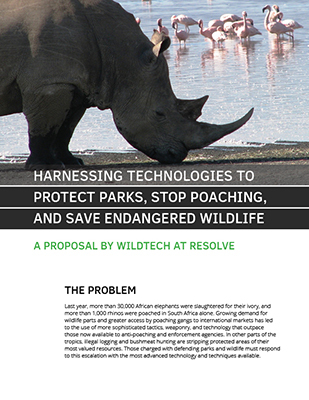 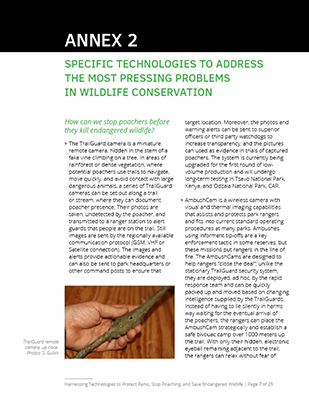 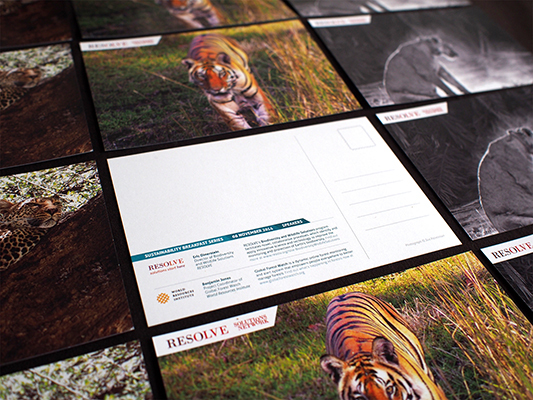 Postcards created for RESOLVE's Sustainability Breakfast event, promoting the new Biodiversity and Wildlife Solutions program, as well as WRI's Global Forest Watch program. 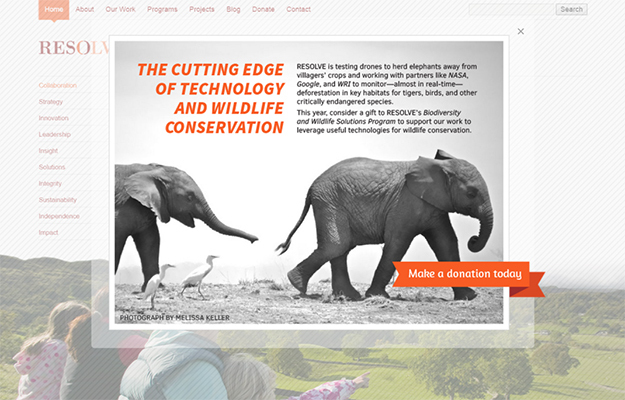 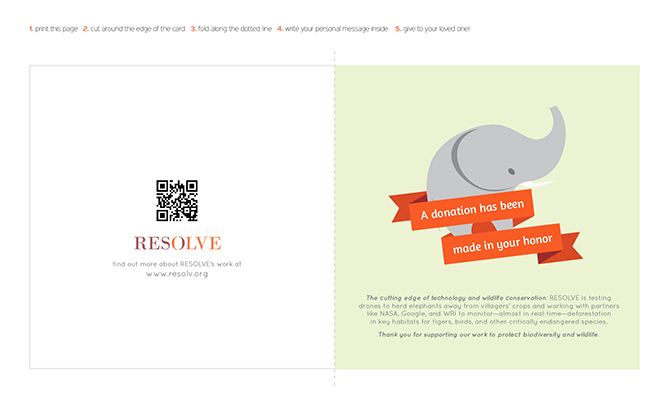 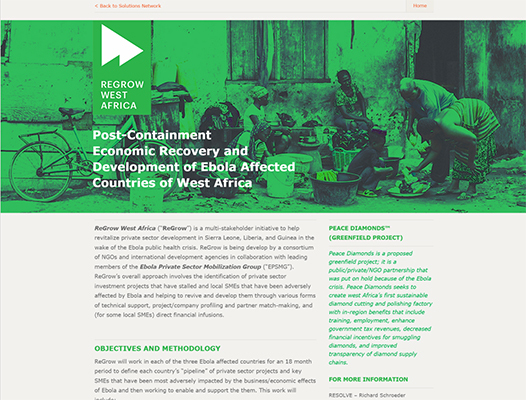 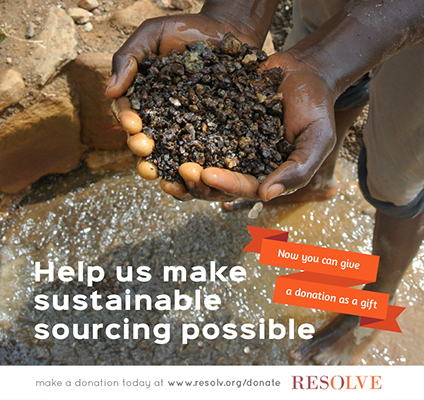 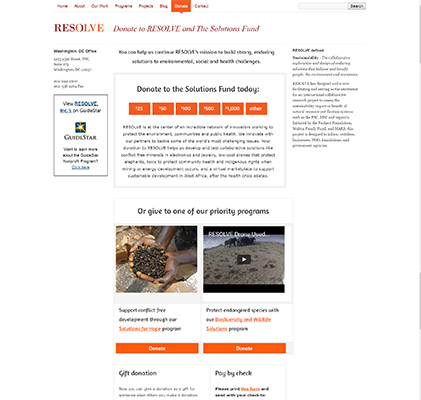 Theme based on two of RESOLVE's current projects - pop-up graphics, email newsletters, social media graphics, and gift cards were created to help draw attention to the Donation page. 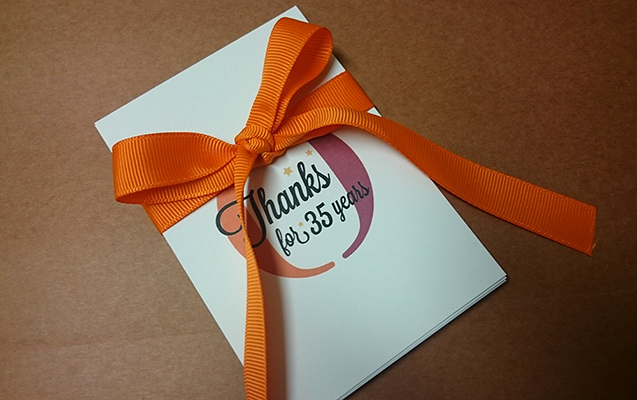 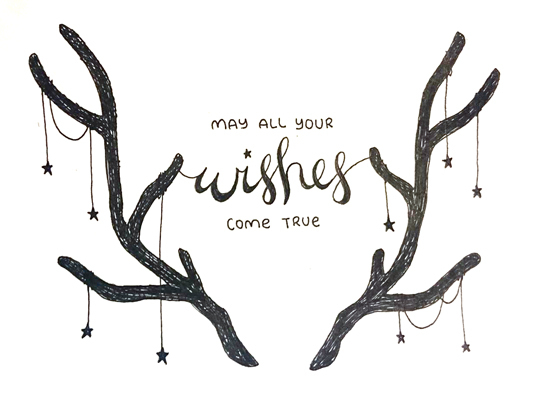 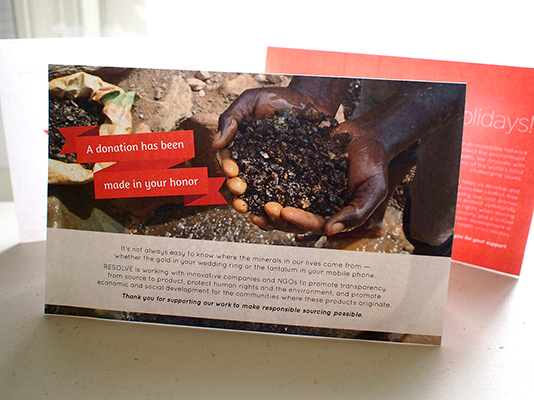 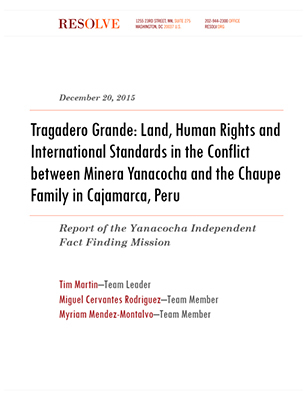 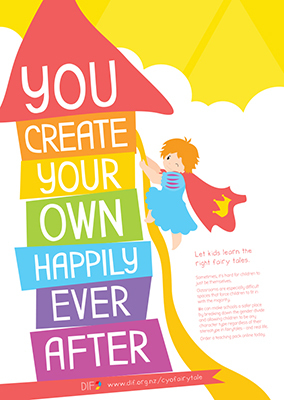 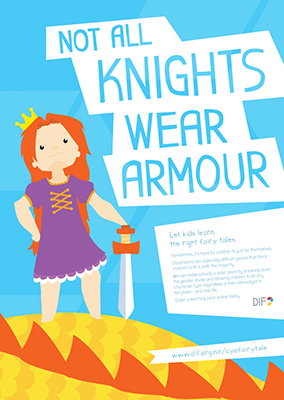 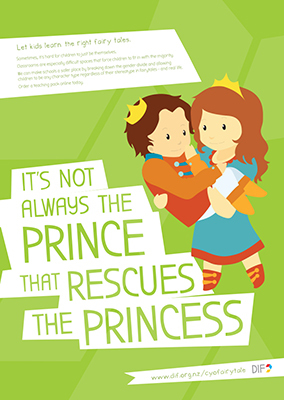 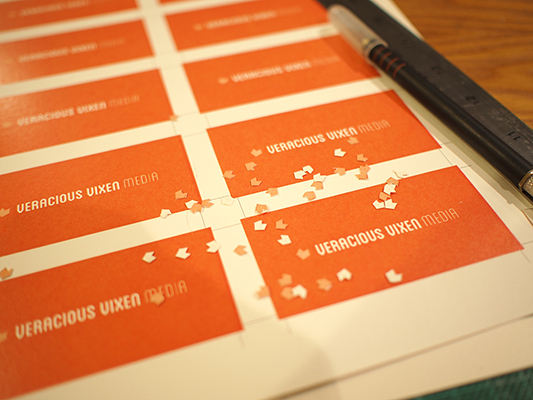 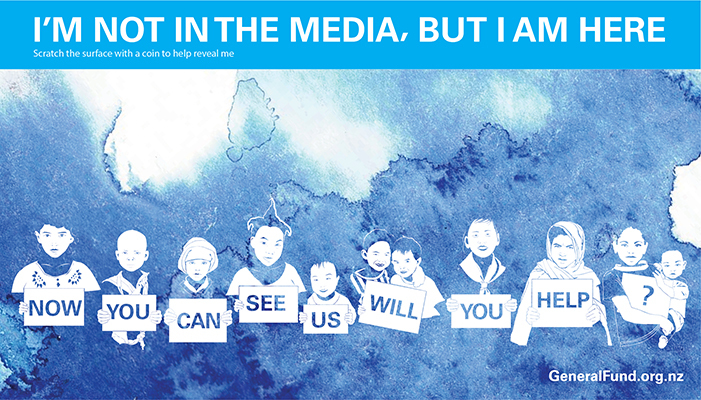 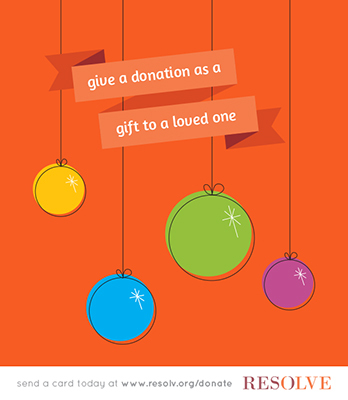 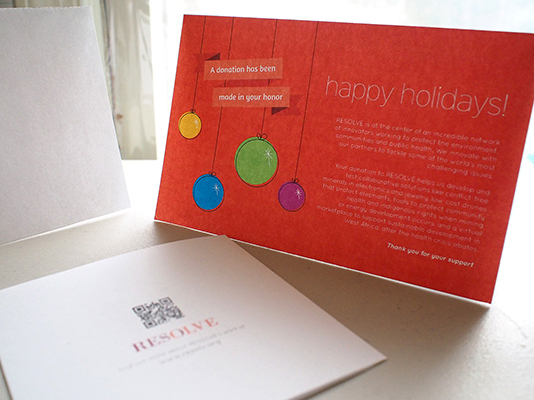 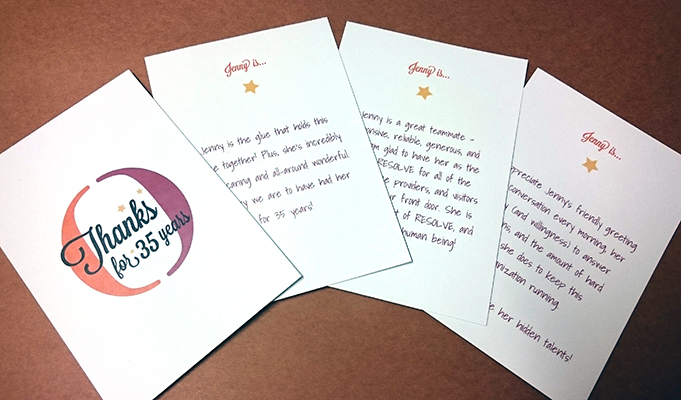 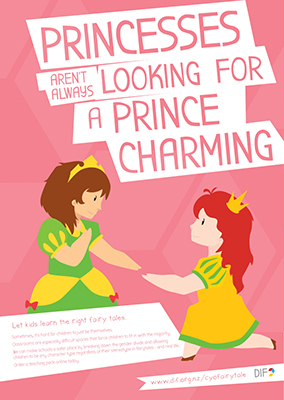 The cards were made to be printable or emailed by donors in order to gift a donation. 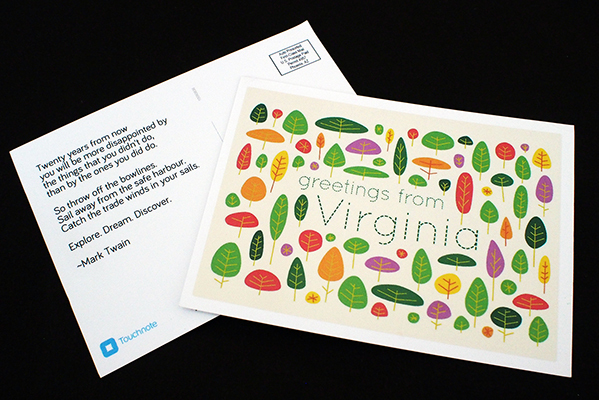 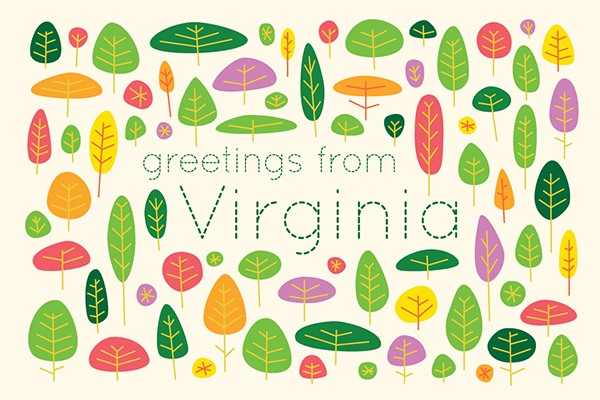 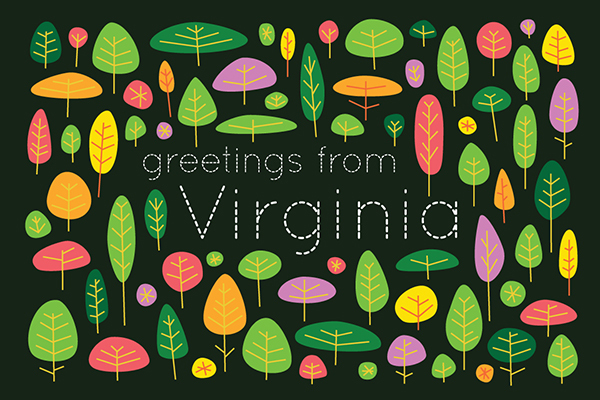 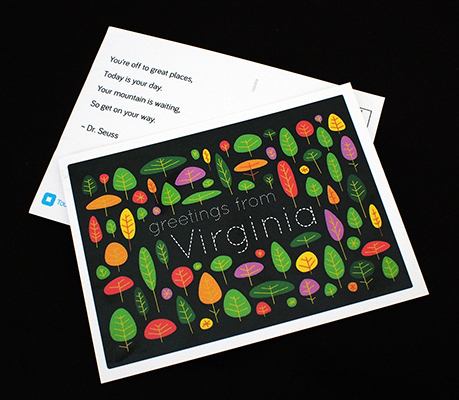 Upon arriving in VA, I was unable to find Virginia-specific postcards, so decided to design my own to send to friends and family. 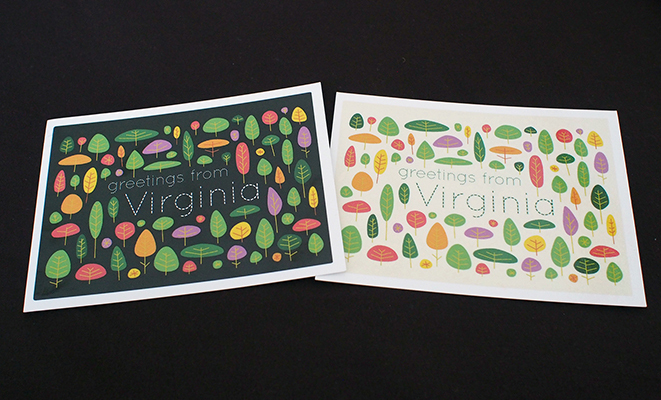 Inspired by the colourful trees surrounding the area, especially as we started to head into Autumn. 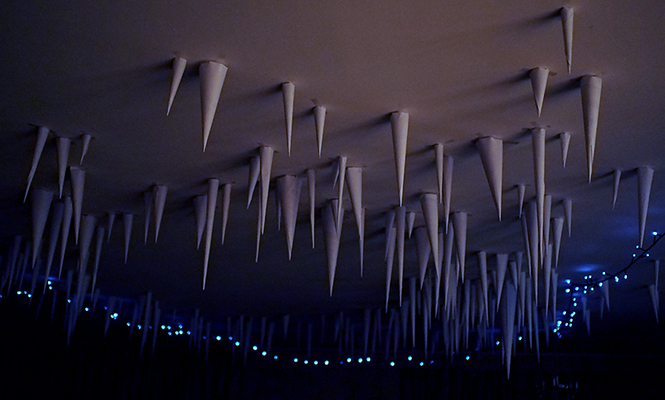 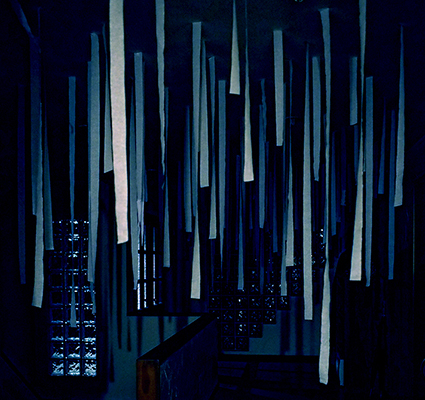 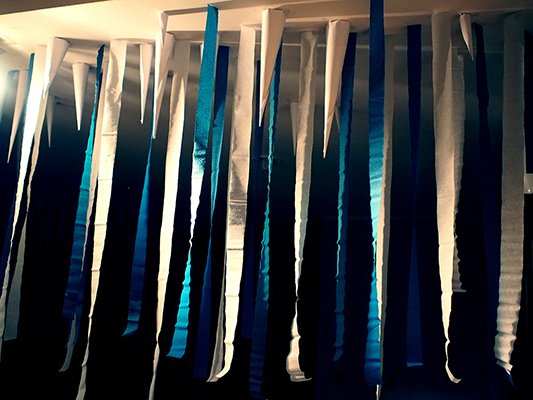 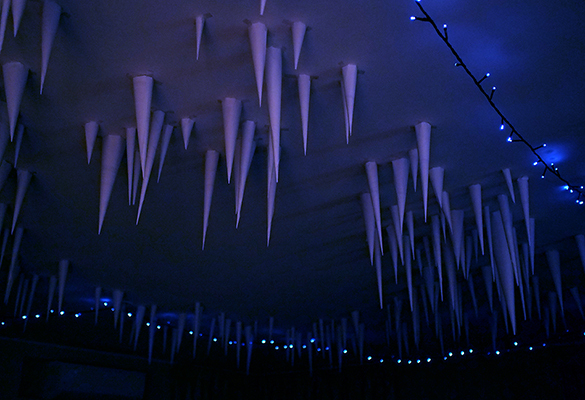 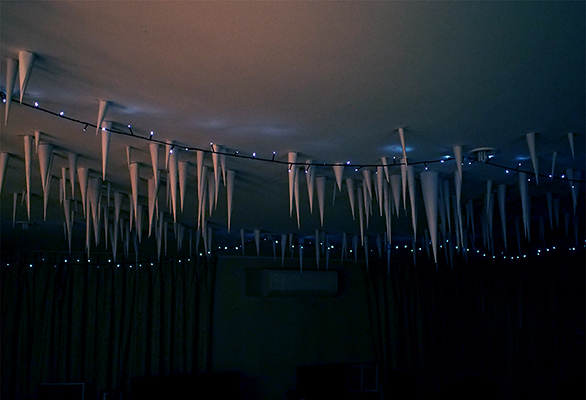 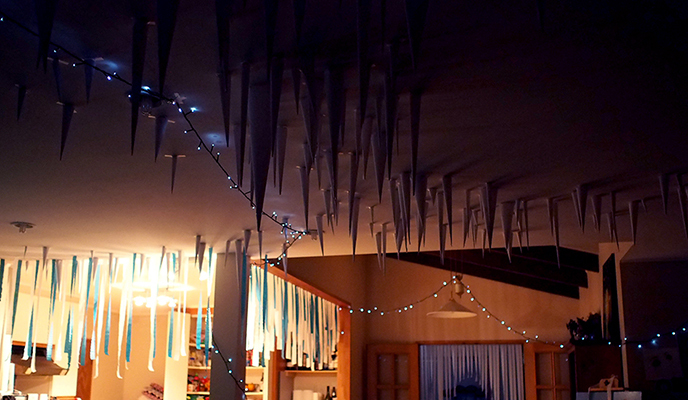 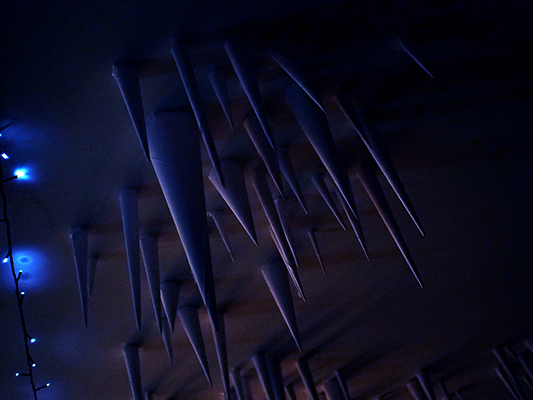 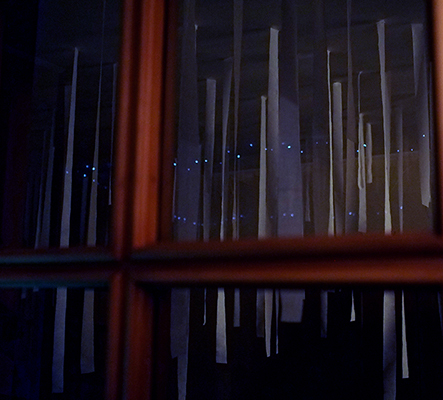 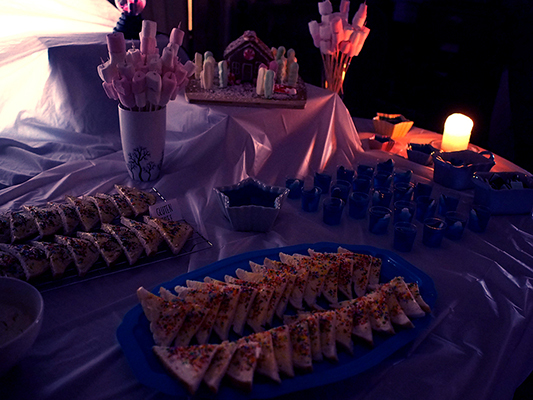 Themed event installation using recyled paper to create icicles. 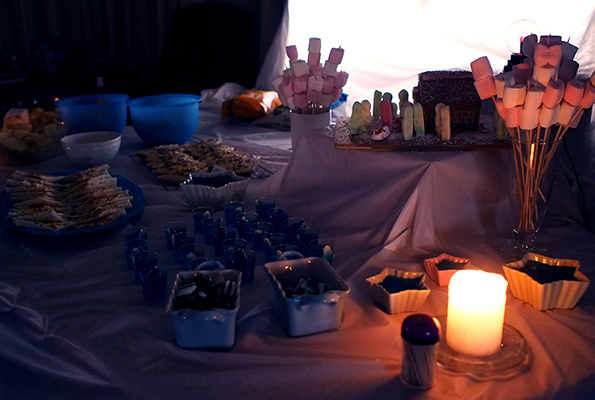 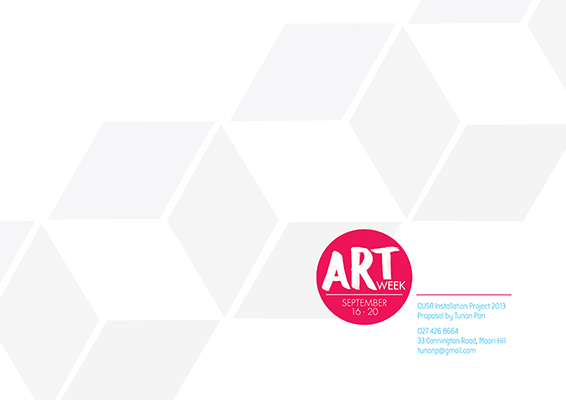 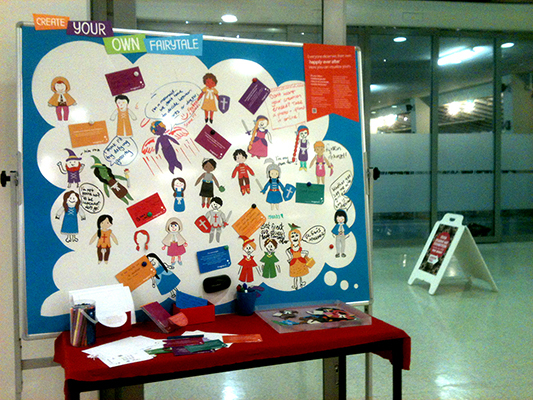 Interactive installation for OUSA Art Week. 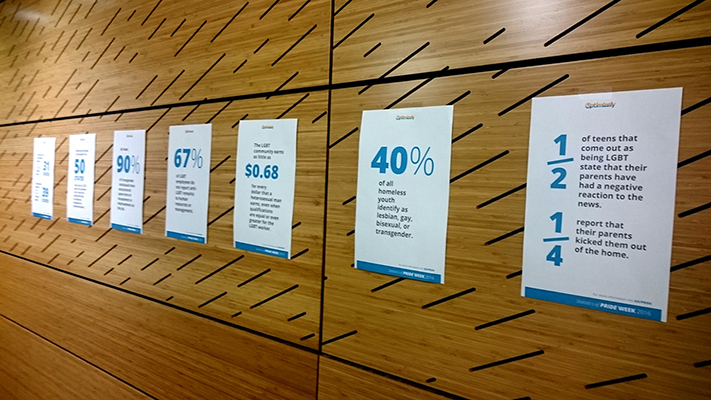 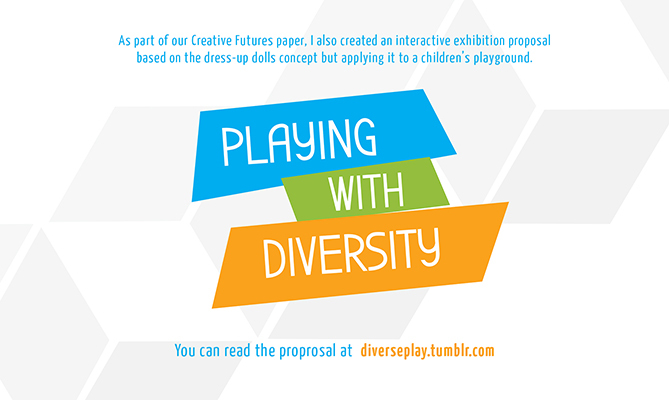 Based on my final year university project looking at gender stereotypes, but placed in a more public space in order to gauge a response and help develop the project further. 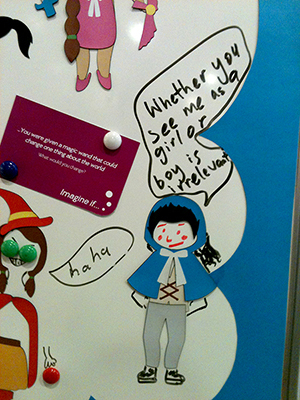 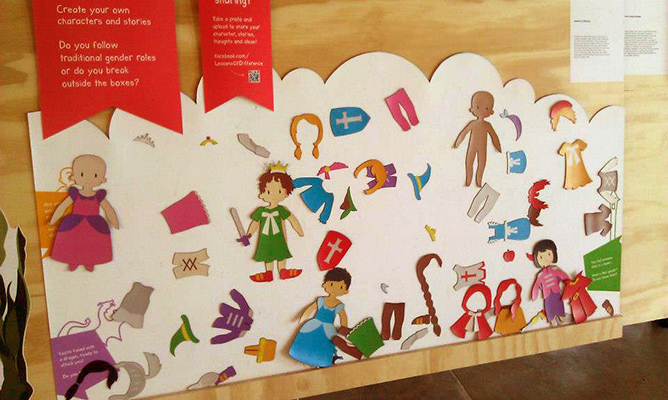 The public are invited to create their own characters/stories with the magnetic pieces, or draw on the whiteboard or paper templates. 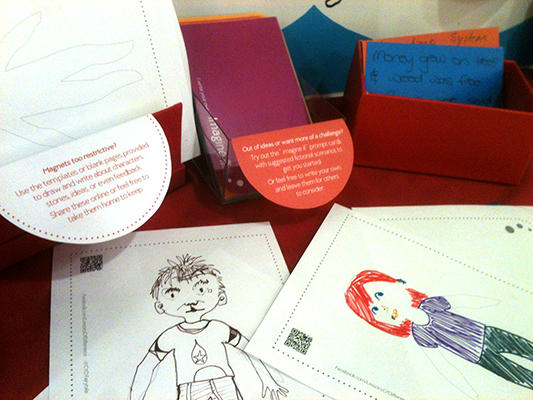 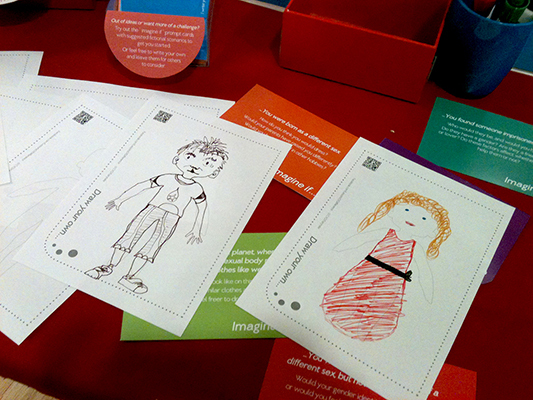 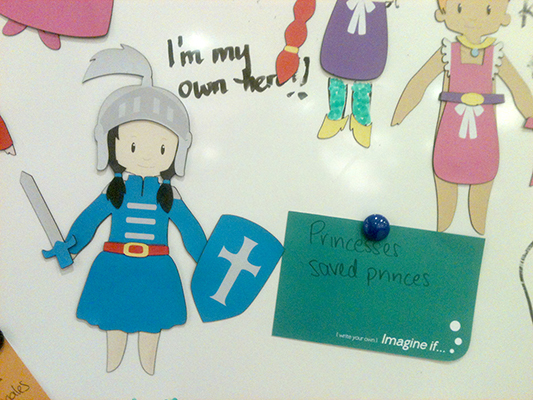 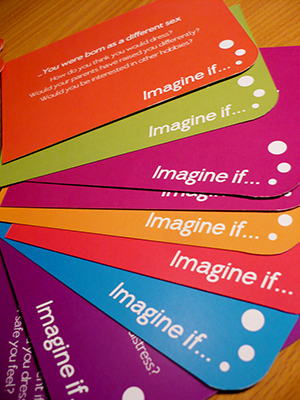 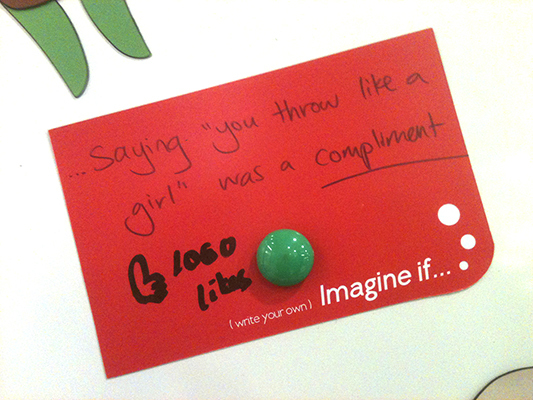 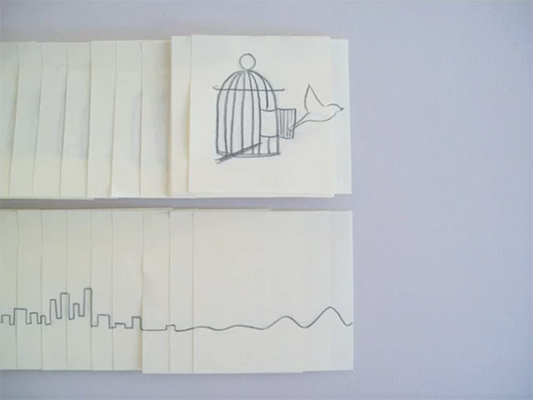 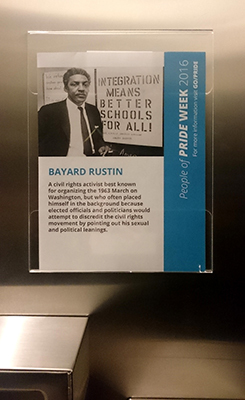 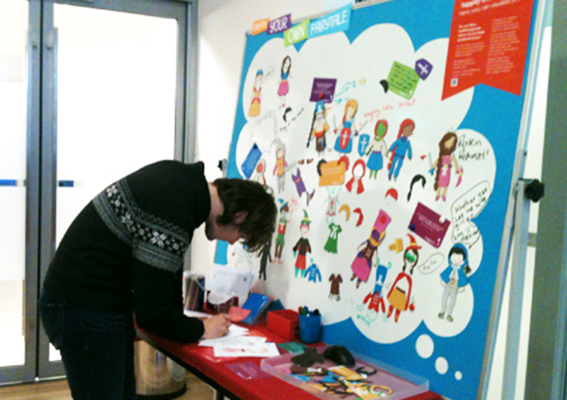 "Imagine if" prompt cards are provided and viewers are encouraged to write their own to help inspire others. 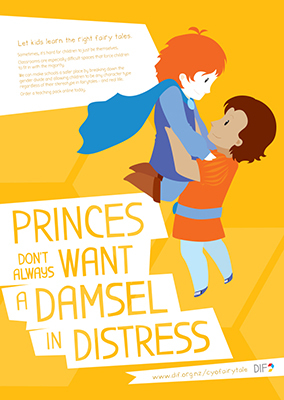 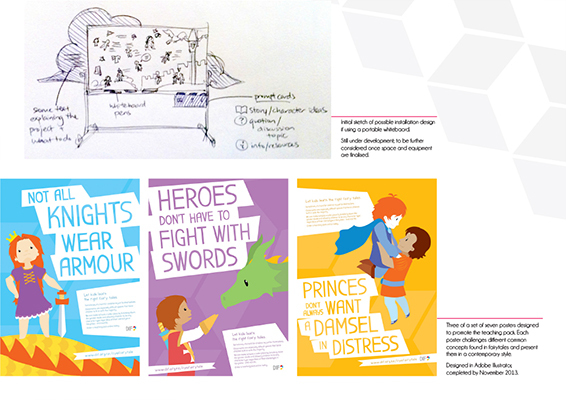 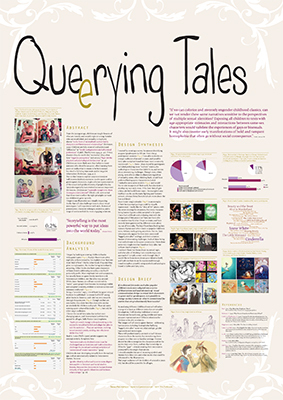 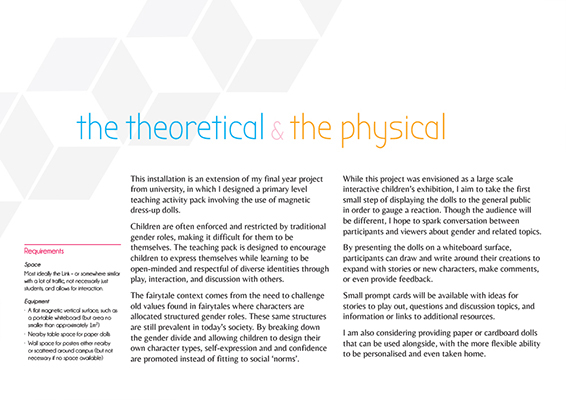 Final year university project - a primary-level teaching aid that allows children to explore gender roles and stereotypes through play and aided discussion. 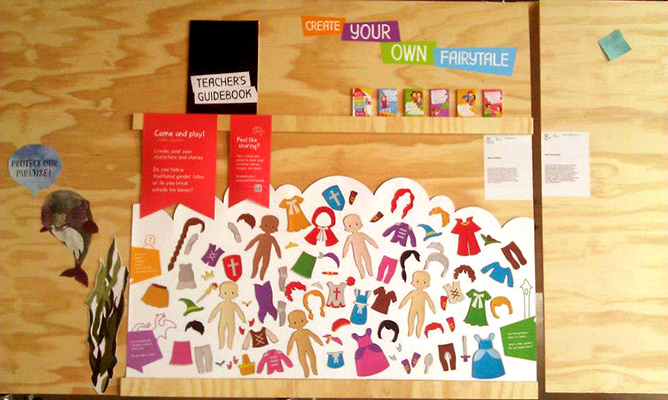 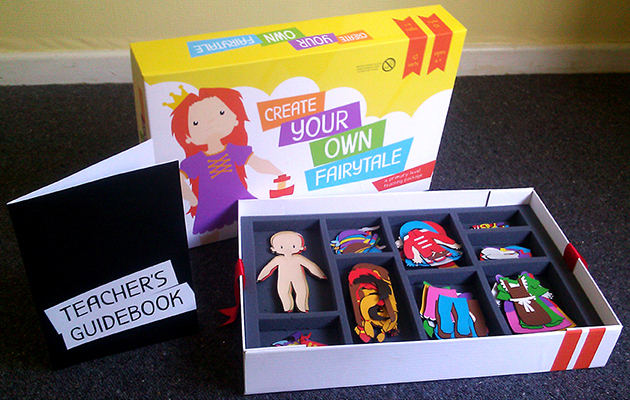 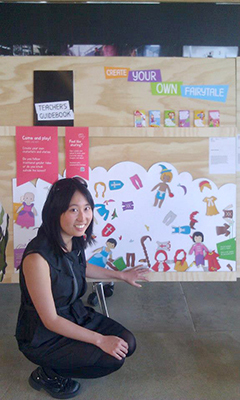 Comprises of game box with guidebook and magnetic dress up doll pieces, along with promotional posters. 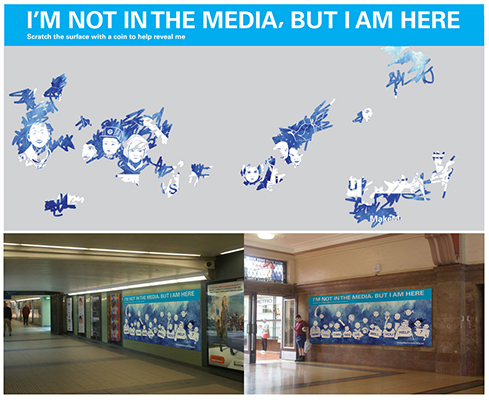 University group project - Our concept was a large scratch-surface poster, where the public can use a coin to reveal the message beneath. 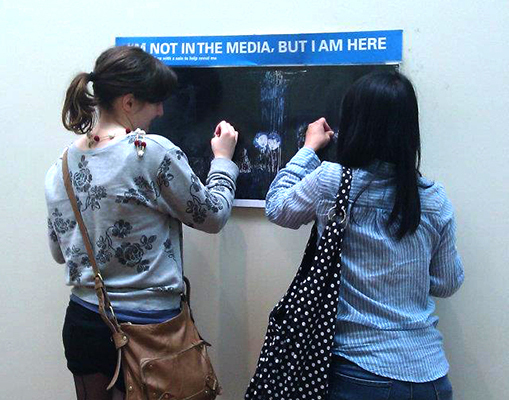 We tested out a much smaller version of the poster created with black paint on top to mimic the effect of scratch card material. 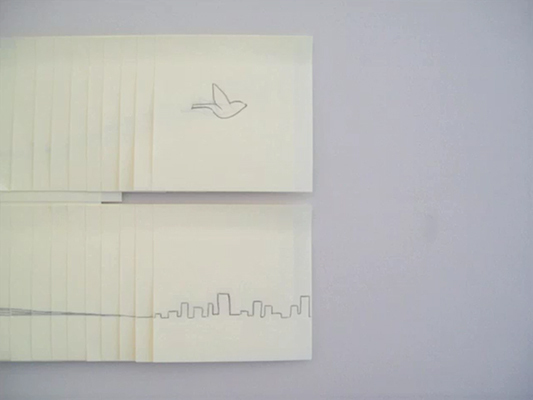 University seqeuntial art project. 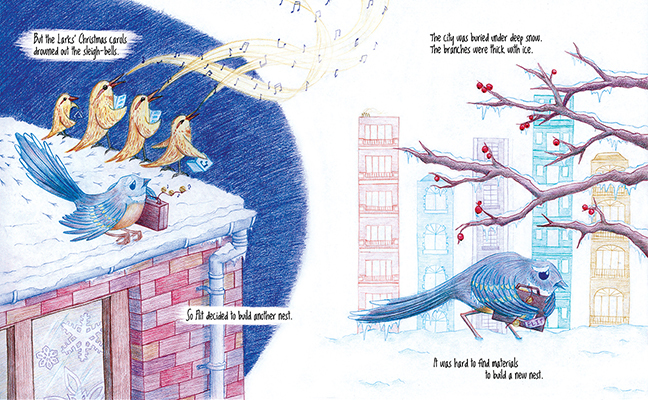 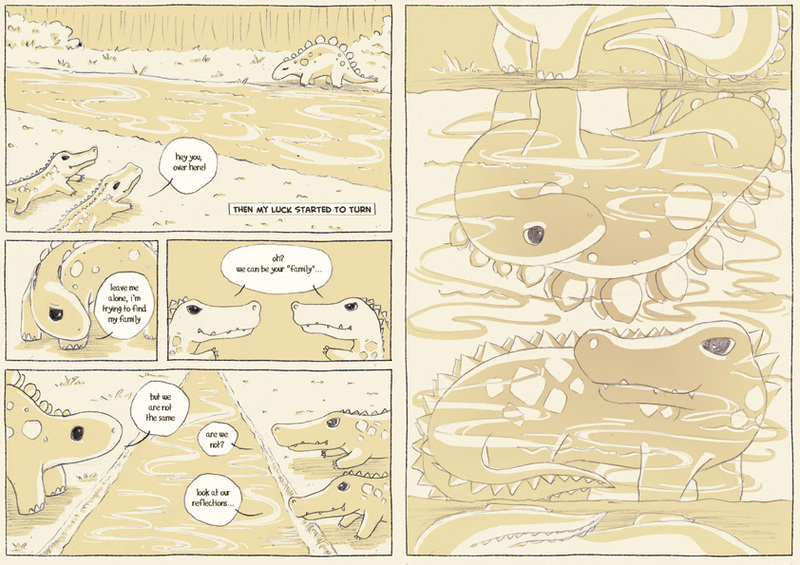 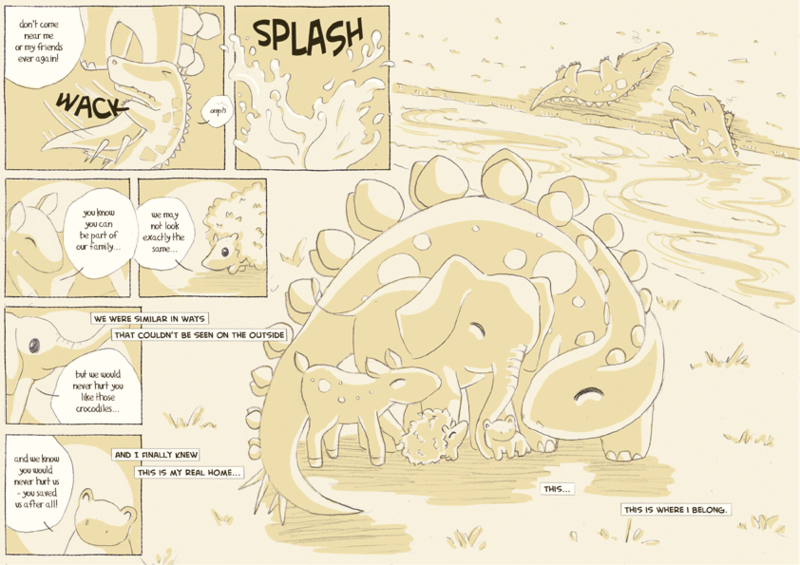 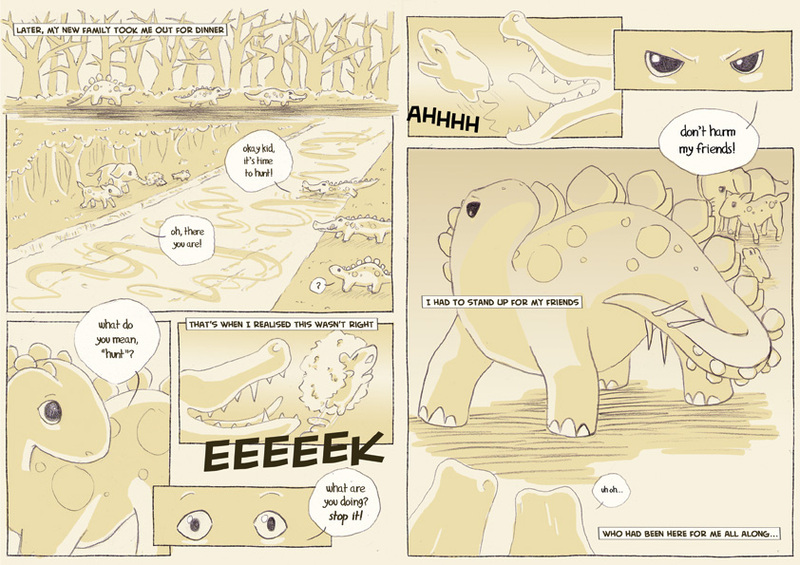 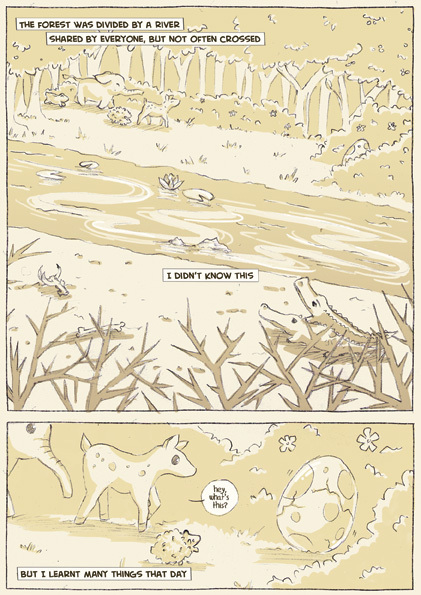 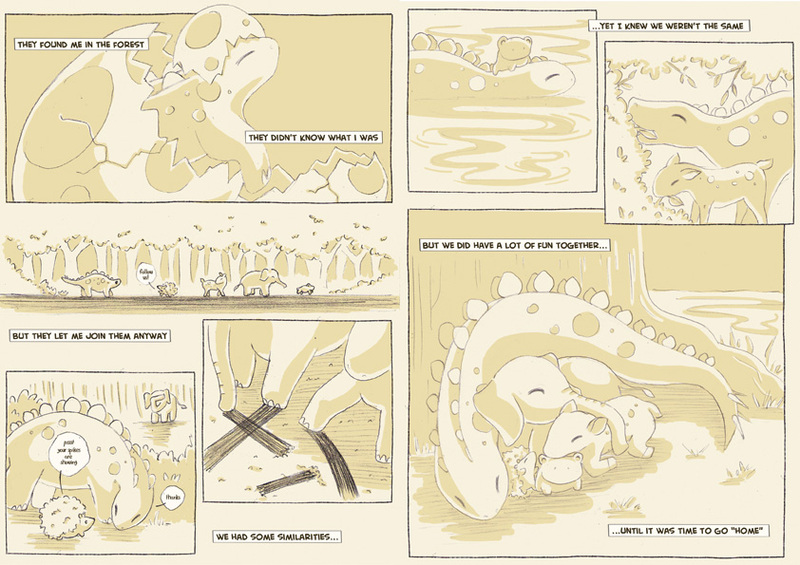 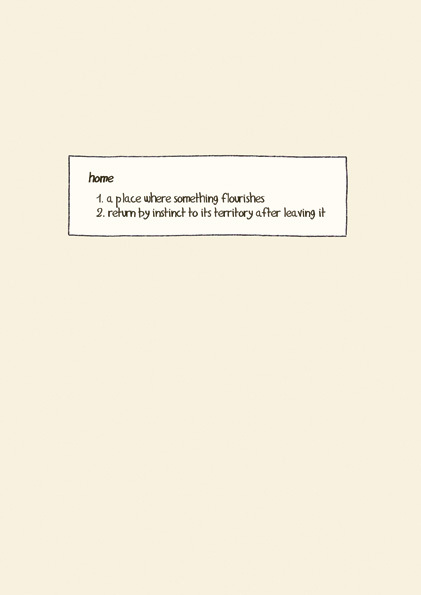 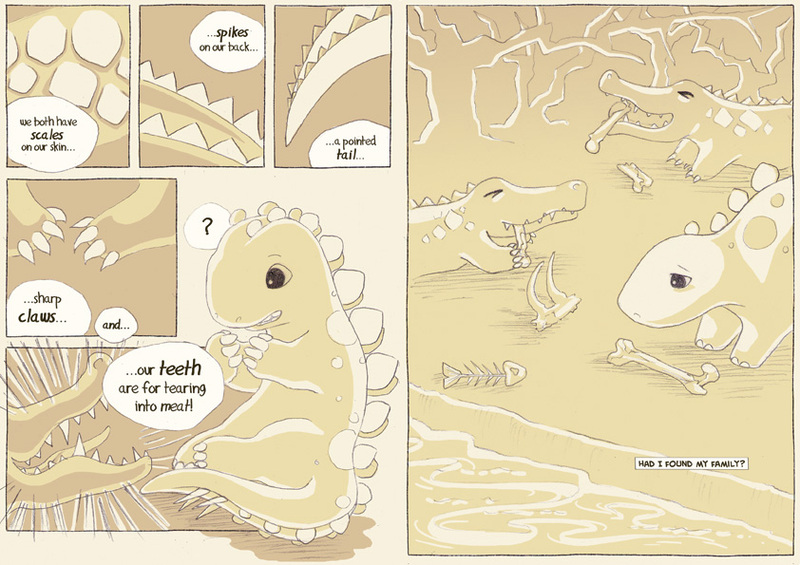 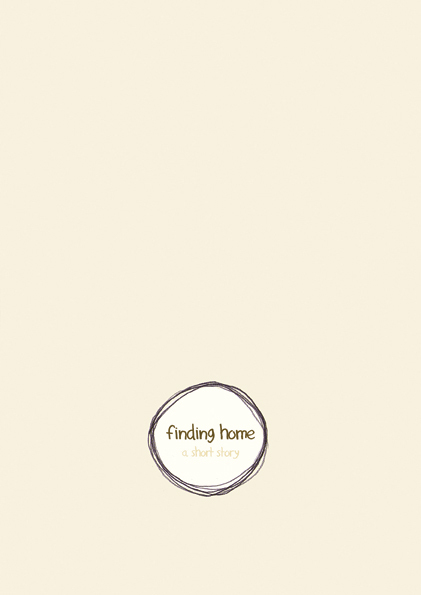 Finding Home is a short comic about fitting in, and the discovery that not everything is really what it looks like. 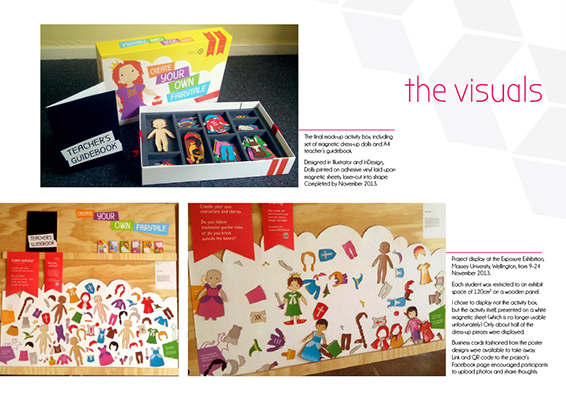 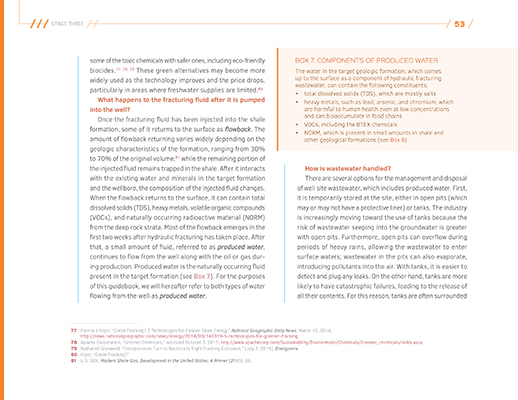 University project creating a mascot and packaging design for an existing food/drink product. 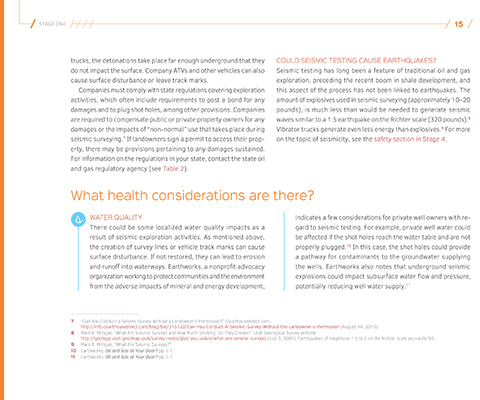 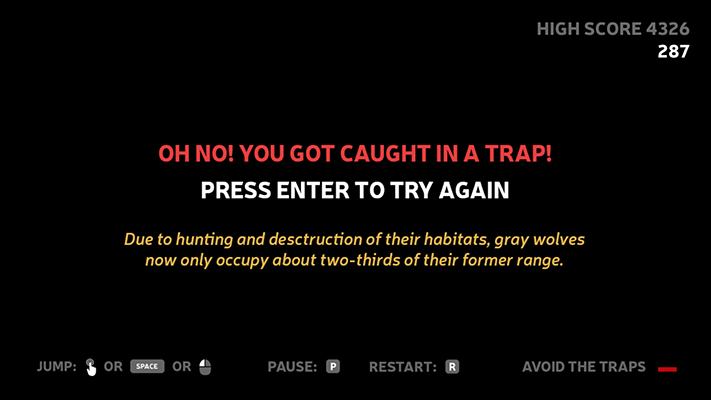 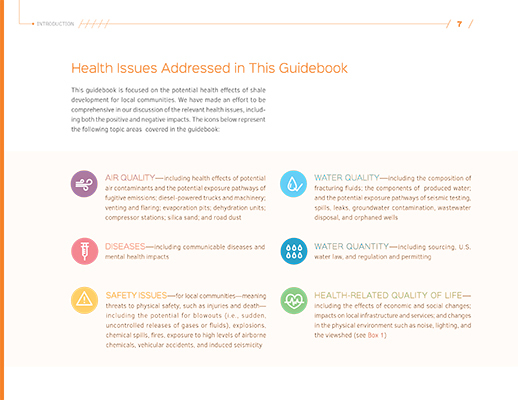 I chose a wine-throated hummingbird for EVR, which contains resveratrol, the antioxidant found in wine. 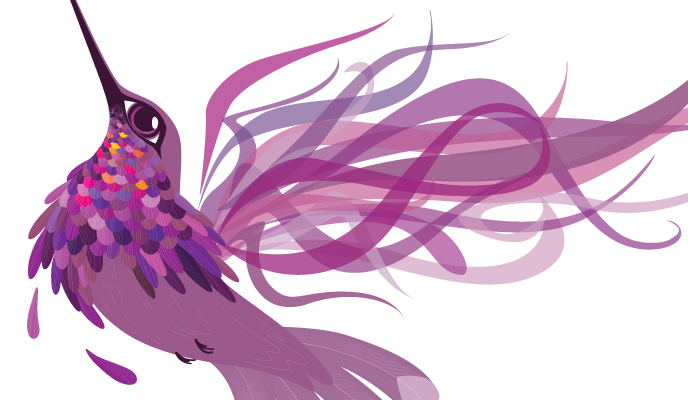 Hummingbirds also represent healing, life, and continuity. 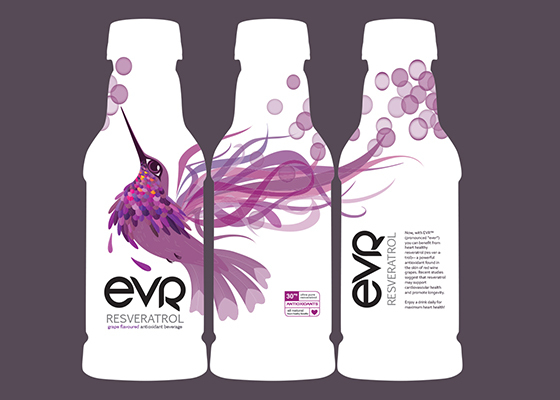 The EVR drink and logo belongs to the drink company. 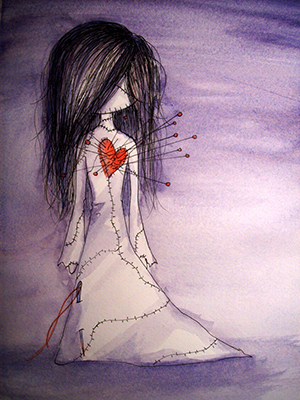 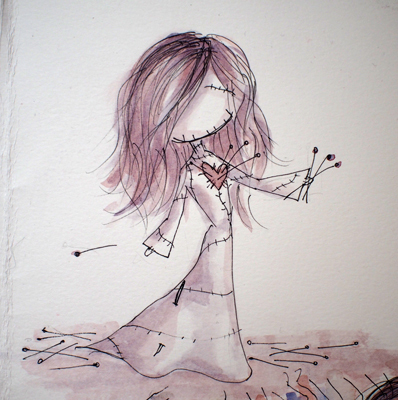 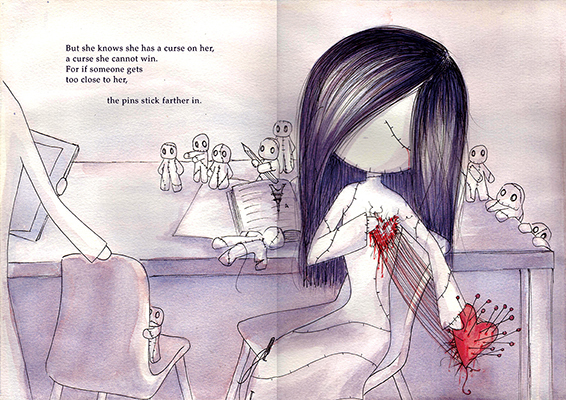 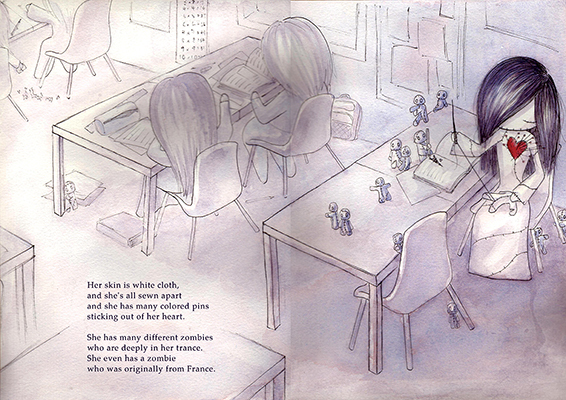 First year university project on using watercolours, creating a character and illustrating a poem (Voodoo Girl by Tim Burton).